The Greatest Christmas Carols Welcome to sing! On Sunday, December 16 at the 11:05 service, the Chancel Choir is pleased to present to the congregation “A Celebration of Carols” by Joseph Martin. raising funds to support the university music program and provide scholarships for music majors. The concert is Thursday, December 6th, at 7 PM in the Sanctuary. We are excited to have this group come to Latham, since we had to cancel their scheduled appearance back in May 2011 after the devastating tornadoes across North Alabama. At the conclusion of the Colony’s presentation, the UMW will install its officers for 2013. Refreshments will be served at the end of our program. other, for our congregations, and our community as we all seek to be outward and visible signs of God’s love. sion and zeal for serving? can partner with the children or youth to Maybe so. Maybe we need to hear have an intergeneramore about our missions tional impact on the more often so we can fo- world around us, helping cus on living out our faith others to connect to God through our actions. You while we connect to one Morris elementary. But know, the Bible tells us another. thanks to the efforts of that “faith without works is dead.” I don’t know And while we are talk- our church (headed by about you, but that makes ing about next year, how Doug Seay) and maybe me very upset to think that about a trip down south? even you in 2013, we someone sees my faith as Nicaragua is the destina- are helping to increase dead. I am compelled to tion for our summer their confidence and skill level through action. mission project this year Panda’s Progress. as we continue our partThrough these efforts, So, beginning in January’s nership with the people young people will gain edition of the Branch, you there. Set some vaca- the skill set necessary to will see an Operation tion time aside or if you escape their social enviChristmas Child needs can’t go, begin to pray ronment and have a real list. In January, for exam- and offer support finan- chance at a strong fuple, the list will have sev- cially as the needs be- ture. What a gift to eral suggested toys for the come known. give?! boxes we will fill in November. Toys are good While this isn’t a full list buys for January because of what we will do this many of the stores will put coming year as missionthem on clearance after aries for Christ, it is a the Christmas rush is over. good place to start you When you go out and toward thinking of how shop, you can pick up a you will be involved in few that you find on sale putting your faith to and bring them to the colwork for God. Maybe lection bins at the church. you can even stop by While you are at it, pick and enjoy something up a few items for the from our farmer’s marfood pantry that we collect ket this spring and allow every month on the second Sunday. And then in And as you read this ar- the wholesome goodness the fall, we will allow ticle, be thankful for the of locally grown food to small groups and Sunday ability to read. Many stimulate your intellect school classes to host students struggle to as you search for how packing parties for the learn this most basic and best to offer yourself to OCC boxes where they yet foundational skill at God. We’ll see you on the mission field! Proposed site on Latham’s parking lot: 75 x 300 feet max. lect the best afternoon/ evening for the market and we will advertise it in the church, community, and region. We have requested $5000 from our church budget to promote the Farmer’s Market. After that, it is up to you and me to support our farmers’ market by purchasing, preparing, and eating the food grown and sold by our famers. If you are would like to serve on the Farmers’ Market support team to help make this dream a reality, call me at 256417-5930 or send me an e m a i l a t [email protected] You can keep up with developments to establish a farmers’ market through my blog at www.downtoearthcrier.c om. the divided wall is now ded i c at ed a s t he “Worship Room.” We built a stage/platform, put in curtains behind it with unique stage lighting in front, painted it a very pleasant neutral “tan,” built a sound booth in one corner and with cabinets under the screen, took out the drop ceiling (but left the grid and fluorescent lights) and added “Christmas Style” lighting in addition to unique custom built “lamps.” We’re adding an indoor waterfull andalter area as well. The thought process behind the design and execution was really quite simple: we wanted to give our youth the opportunity to take that space and really make it theirs. Their input was solicited for every change. We also wanted that space to reflect our church’s vision to connect generations to grow relationships with God, others, and creation. Moving forward, we plan on utilizing the kitchen to better connect with other generations. The dedicated fellowship room was designed to better connect with each other, and the dedicated worship room was designed to better connect with God. This is an exciting time in Latham’s youth ministry. Even though you can’t necessarily measure everything “by the numbers,” we’ve consistently had 20-25 youth attend on Sunday nights and we’re growing with numerous new faces. Monday morning Prayer Breakfast is seeing significant turnout at 7AM – and there is an air of excitement in this place. Come and join us. We’re having a lot of fun in the Lord! This is a time for fun, food, fellowship, and fuel for your soul! Take one night this month just for you, your girlfriends, and God. See you there! and why she wrote it, and then reached in her car, took one out and autographed it for me. It’s a really good book too! We had two neighborhood friends that came and helped us regularly and brightened my day with their enthusiasm to sell pumpkins. They felt like they had a “job,” and it made them very happy. The youth and children’s departments sincerely want to thank those who volunteered to sit at The Patch. There weren’t many wet days this year, but there were some pretty cold ones. We know it was time taken out of your schedule that you could have been doing something else, but your help was really appreciated!! pounds of non-perishable food items from our collection. Did you know 50 pounds of food feeds a family of 4 for 4 days? So much to be grateful for! Happiness is spread when we share our love w i t h o t h e r s .
Elderberries December Activities Elderberries planned activities for December are a trip to the Botanical Gardens to tour the Galaxy of Lights December 11 and the regular monthly meeting December 20 when we will be entertained by the Wesley Singers with a program of Christmas music directed by the talented Chris Klaus. Visitors are welcomed, whether or not they are members of Latham and/or the Elderberries. For further information or to make reservations, contact Shirley Hayes at 256-881-1873 for the Galaxy of Lights tour and Dot Coombe at 256-881-1608 to attend the regular meeting December 20. You will find a warm welcome at Elderberries activities, enjoy good food, fellowship and entertainment and maybe learn something new from our programs. day! All of the children ages 2-4 years participate in various roles and sing holiday songs. It takes place on Wednesday, December 19th at 11:30AM in the Sanctuary. Our program is open to all who wish to feel the joy of the season. In the theme of giving this holiday, LUMCDC will be sponsoring a Children's Pajama Drive again this year to benefit the Manna House of Huntsville. December 314 new pajamas ranging in size from 6 month-6 years can be hung on the garland in the Children's wing. Your generosity is a n o t h e r ’ s b l e s s i n g! Happy Holidays!! to make us intergenerational in all of our growth in Christ. We don’t have to look much further than Jane Smith and the Kataluma class for a great example of this in action, just this month. Get together with your class and think about which projects you want to make your own. If you wait too late, the “good” one will be taken. Talk to other groups about being partners and get moving. January will be here before you know it! Bible Study Young Adult Bible Study Every Tuesday night, there is a young adult Bible study held at Bro. Scott and Sarah Smyth’s house. It starts at 6:30 and is BYOD (Bring Your Own Dinner.) Then at 7:00 the discussion begins. We are currently going through the Experiencing God study. This is open to all young adults in the church, married or single. The Smyths live behind Latham at 100 Strong Circle SE. Hope to see you there! were Janet Watson, Windy Geisinger, Howard Trowbridge, Doug Seay, Jane Smith and Sam Zeman. efforts of Sharon Windom, Jenny Lowery and Shirley Fugit. Hope you will enjoy the pictures and plants as they continue to appear! appealing and inviting corner or area; consolidation and standardization of bulletin boards to create a more attractive, uniform 4) The ugly and non- way to present communicafunctional water fountain in tion items and pressurethe business wing has been washing the courtyard. removed as has unnecessary We hope you will walk furniture. (Future water around the church to see fountain solution is still these results, thank the volpending due to the cost.) unteers and offer your sugComing Next: Placement of gestions for additional more attractive pictures in beautification projects. 2) The big pines on the Weatherly Road side were trimmed to make our signs more visible, and the dogwood were trimmed a bit for a more pleasing appearance. Our tree trimmers were Jim Geisinger, Keith Welch, Don Lambert and Hughey Reynolds. some areas; placement of Committee members are 3) Bathrooms are being donated furnishings in pub- Windy Geisinger, Keith “spruced up” thanks to the lic areas to present a more Welch, Jane Smith, Shirley Fugit and Liz Hall Zeman. “Very good, difficult subject.” “Timely topic. Generated a lot of thoughts.” “Enjoyed the company of my tablemates. We shared some very meaningful stuff.” Come and be a part of Lifetree Café! DEAR RECIPIENT: . We will mail paper copies only to home-bound members and to anyone who calls the church office to request a paper copy by mail. You have probably noticed that the Christmas fairies have descended, sprinkling Christmas decorations and spirit throughout the church. Actually, these Christmas “fairies” are the Worship Committee. The fairies are Judy and Jim Gillespie, Adelaide Cape, Sharon Windham, Jennie Lowery, Rosemarie Bishop, Becky and Bill Vosahlik, Joyce Smith, Mike and Michelle Gray, Jan Sturbois, June Young, Jack and Sandra Matheny, Ken Stephens, Catherine Gris, Don Lambert and Molly Hall. As you enjoy the Christmas Spirit at LUMC this Season, please thank the folks that help make it possible. 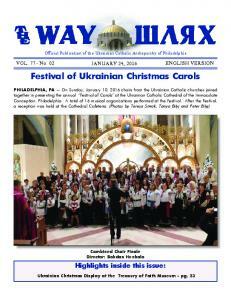 Report "Christmas Cantata: A Celebration of Carols"